Yay! thanks for this – it’s getting bookmarked! Cute hats! Thanks for the pattern. yes i will be making more… but they won’t look as good as yours!!! thanks for posting. Thanks for these Julie – they will get used I promise! wow. this is wonderful. i think that it’s a great idea!!!!!!!!! I just finished making the Ten Cable hat. It’s adorable–thank you! I completed the Ten Cable hat and it is absolutely adorable! Thank you for sharing the pattern. Now all I need is a little cable sweater. and it’s free. You can link to it if you’d like, but you don’t have to. I’ve linked to your adorable hats, of course. Love, love, love the ten cable hat!! It is my new favorite shower gift, it goes really fast. Working on the socks by courtney on pinkladyknits and they seem fun too. Any plans to create a matching blanket, anyone? Thanks for the pattern. how might i adjust this for a toddler and a kid (7) size? I would really like to make matching hats for my twins and my 7 year old. I am making the baby size now – this is my first cable project and your instructions are sooooooo clear!!! Thank you. I love that you give preemie sizes – my twins were micropremies and i try to make hats for the nicu when i can – parents really do appreciate getting something special and handmade – especially when the babies are having a bad day. Hi. I made the ten cable hat for my baby son last year and everyone commented on how lovely it was. Now I would like to make some to sell to friends to raise money for breast cancer awareness and other charities. Do you have your permission to do this? Thankyou. Question: Pattern instructions for the “Cabled Baby Hats” reads: “CO 80 sts, pm, and join to work in the round.” What does “pm” stand for? For the 10-cable knit hat I am lost as to what the “C6F” part in the below line means. Does this mean to cast on again? Thanks! I adore this pattern! I have used it dozens of times and even adapted it to adult size. Thank you for posting it! Can’t wait to try the earflap pattern. Hi Kathy! I’d love to hear how you adapted the 10 cable baby hat to adult size. Thank you! Thank you so much for making your wonderful hat patterns available. After printing out a couple of patterns, I’m looking forward to knitting at least one hat for my grand-daughter! (Apologies … I seem to be unable to send money online.) May the Blessings Be! things have been going along peachily; but i just got to the decreasing stage, and am a bit mystified by “SSK” — is that “slip slip knit,” meaning: slip two stitches knitwise to the the right needle and then knit the next stitch? i did this, and things seem a bit hairy for me, now — not ending up with the right number of decreases at the end of the row 26 / 27. It is a beautiful hat. Needle Exchange » A Very Special Episode of Saturday, Pattern Day (#36)! mei[at]knits,bakes&thinks » The start of some baby knits! baby@thescarfer.net » Blog Archive » The start of some baby knits! Thank you for the pattern…I will donate to the new born unit @ local hospital in memory of a dear lady. I just finished making a preemie 10-Cable hat and a newborn 10-Cable hat, and I love, love, LOVE how they came out! Your pattern was so easy to follow! I have a toddler though, and I want to make some for him, but have no idea (other than messing around with thicker yarn/bigger needles) how to modify the pattern for a toddler. Could you pretty please post a pattern for toddler/childrens/adult sizes? I love, love, love this pattern. I’ve used the SweaterBabe version a few times and just ran across your variation. I used the 5-cable pattern for our first baby (one in pink, one in blue) – we don’t know if we’re having a girl or a boy, so one will go to our baby, the other will be donated to the hospital. Thank you! Hi! I love your pattern and would love to make one in a toddler/child size. A friend of mine lost her baby after 9 days to trisome 18. He wore a very similar hat and it was sort of his trademark. I would like to make 2 hats for the mom, one for her little girl (5 yr) and another for her son (3 yr). I have tried a bit with the same pattern and larger, thicker yarn, but it just comes out “thick.” I love the Debbie Bliss cashmerino… I know I am imposing, but if you had some time, would you be able to do me a huge favor and modify the pattern for an older toddler/child? I would be sooo grateful, and I will take photos of the new hats and send them to you to show you my thanks. :o) I am just not that good with the mathematics of knitting, and the decreasing/increasing (yet). For toddler/small child, I would go down one needle size and cast on 96 stitches instead of 80 and follow the instructions as written, adding a little more height (possibly repeating rows 18-25 before starting the decreases). I’m sorry that I don’t have time to test it…I’m in the midst of a really time sensitive project…but that is definitely where I would start! I also don’t understand the meaning of the ssk. in the pattern for the five cable hat.Can you please help. SSK = slip, slip, knit…it’s a left-leaning decrease. Hi, just wanted to tell you that I loved making your 10-cable hat for my newborn. I have some really great pics, and I would love for you to see them! You could also post them on here if you wanted. Thanks for sharing the pattern. I’m excited to get knitting it. Lovely – thank you so much! I want to make a cable hat that is more square.. .. i.e with two tassels on each corner.. ( or rectangle.. )I knit for a photographer. Can I use this pattern.. do I still CO the 80 stitches..
Where I’ve been « the knitrider... erika's colorado springs knitting blog! Quick baby hat « the knitrider... erika's colorado springs knitting blog! Your Baby Cable Hat is truely my favorite. I’ve knit it in CottonFleece and it is precious. Any chance you have the same design in a size that would fit a 19 year old? I have a cable hat pattern but I love the way yours decreases on the top. It is so neat. Would love to hear from you. i really want to try this pattern, and I just want to run my materials by you. I’m ready to try cabling, but I am still a youngin at knitting, so I’m a little cautious before I start. it is for a newborn, and my yarn is 100% cotton worsted weight (size 4/medium) gauge is 16sts/1inch. will 80 sts around be too wide a hat for a newborn? what is the measurement of the circumference of the hat when it is through according to the pattern? Haha, let me emphasize that you need to knit your swatch in-pattern (cabling and all) and my comment was based on the assumption that you did that. If your swatch was in stockinette, re-do it….you may find that your gauge is very different! I just started teaching myself to knit this past week, and I am confused on the ribbing. Am I using one 16″ circular needle to start? And is it supposed to look kind of crazy after you join and do the first round? The sts seem kind of tight and sloppy looking? Thanks! I am having a hard time with ribbing. I hope I can get it today!Thanks again. Any chance you sell these hats???? in cream ?? I love making this cable hat, and have made it many, many times. However, I began the 5 cable wrong. Instead of doing Row 10 as I should have, I began Row 10 with C6F, K6, p2 etc. How will I make the correction for the decrease rows beginning with R26? Jeanne, you can just sort of reverse the instructions….you’ll notice that each 6-stitch section is flanked by two P2s….so just switch them (i.e., row 26 would be *C6F, P2, SSK, K2, K2tog, P2* instead of *SSK, K2, K2tog, P2, C6F, P2*). Love this pattern! I have a 6 mo old, a 5 yr old and a 7 yr old. How would I make this hat in the larger sizes?? I am new to knitting so any help would be so appreciated! Thanks!! Thanks so much for the 10 cable pattern. I have 4 friends all due in a few weeks! I didn’t want to make my hats from my own patterns for them- that seemed a bit presumptious- so this little hat was just perfect! Me too. Would love to have this pattern for a 3 yr old and a 7yr old. Please post or email if you do! Thanks a bundle. I made two 5-cable hats for a ten-week old baby, and they fit great! He should be able to wear them through the winter. This is a great pattern – thanks! Wow! This is such a wonderful baby hat! I’m going to knit one for my 8 month old niece. Thanks for the pattern! I wanted to make this hat for my 4 mo. old son. I tried the 5- cable newborn pattern, but his head is too big (17 in around). I was wondering if you had any advice on how to adjust your pattern to make it fit. Also, what do you think about knitting it in bamboo? Beautiful! 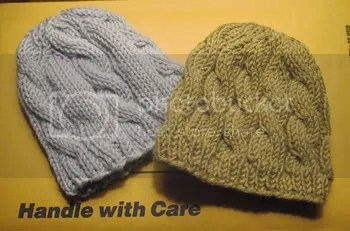 I’m wondering how to alter the pattern of the 5 cable hat for a super bulky weight yarn – any help is much appreciated! I am dying to make your cable hat..however, I have a couple of questions which I would be very grateful if you could answer. I an fairly new to knitting in the round….Does US8 and US3 refer to the size of the 16″ circs and dpns? Later the pattern says switch to two circs or dpns. So ,does that mean I start on normal needles?Secondly, how do I divide 80 stiches on 3 dpns or should I use 4? Reblogged this on Diane's Thoughts. What does c6f stand for? You’ve got superb webpage. A brilliant about the eyes so that it’s additional enjoyable will be paid a visit to your blog together with take a look at sometimes. You could have great web-site. Making closer so you might completely taking advantage of the look along with kind of the web page. Isn’t it about time a hassle-free regarding the vision turning it into significantly eye-catching we would develop the following along with consider sometimes. Doing pretty well so far, but what does SSK mean? Just starting to decrease…. I’m sort of a beginner. I know the basics of knit and purl. How to rib. But I have made anything with cables I guess is what it’s called. If anyone can help me with what C6F and SSF are and how to do it I’d really appreciate it. I’m wanting to make this for my son. It is super cute. This pattern turned out great! I love this hat but without the gauge and the final measurement, I don’t know how to modify the pattern to fit my 8 month old whose head circumference is 18 inches. And I really want to because I love the hat! Hi Melanie. I made a bigger hat by using Julie’s instructions from September 2, 2008. Using size 7 needles, I cast on 96 stitches and repeated rows 18-25 twice. My year old son has a 19 1/4 inches head circumference. It just fit him with no room to spare! Hopefully this helps. I don’t know the gauge but when I did rows 18-25 twice it added an inch to the hat. I am going to try another one with 112 stitches cast on and repeat 18-25 four times so it will fit my son better. Hello! Thanks so much for sharing this pattern. I made the 5 cable hat and the pattern read pretty well. This was my first time attempting cables and they turned out so cute. I was going to post the hat on instagram but wanted to give you credit for the pattern. Do you have a hashtag name I can include? I am new to instagram and haven’t had much practice adding links to others.